Supreme Court And Congress Party websites hacked By Anonymous! On a day the government said in the Rajya Sabha it would build consensus on rules for controlling internet content, an international hacking group named Anonymous reportedly breached the websites of the ruling Congress and the Supreme Court of India with the name #OpINDIA. "The hacking was reportedly in response to the blocking of torrent site thepiratebay.com and vimeo.com. 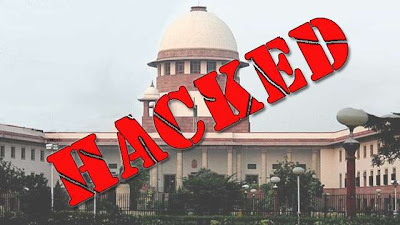 While the Supreme Court of India website came back online after a little while, the Congress website was still offline at the time of filing of this report"
The Department of Telecommunications (DoT) website had also reportedly come under attack. The Delhi Bar Council also claimed that its website was defaced by unidentified hackers. Hacker group Anonymous is believed to have attacked the websites in response to the Centre blocking torrent portal Pirate Bay and video-sharing Vimeo. 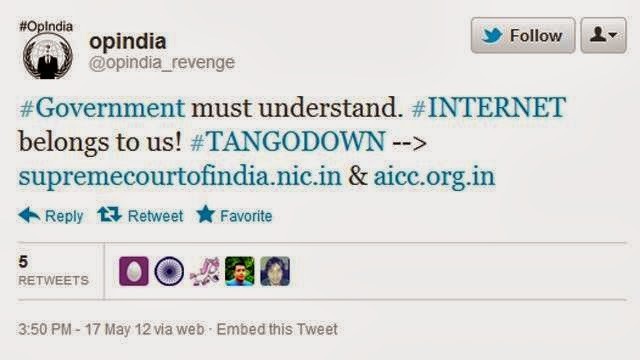 The group is said to have launched “MT Operation India” to protest the government's censorship plan. While both the Congress and SC admitted their sites (supremecourtofindia.nic.in and aicc.org.in) were down for sometime, they denied the sites were hacked. Anonymous Central had earlier tweeted, "Namaste #India, your time has come to trash the current government and install a new one. Good luck." That attack came just days after telecom minister Kapil Sibal asked social media networks, including Facebook and Twitter, to remove offensive material from their websites.